alaTest has collected and analyzed 43 reviews of Mustek DV 5000. The average rating for this product is 3.9/5, compared to an average rating of 4.1/5 for other Camcorders for all reviews. People are impressed by the color and size. The portability and price are also appreciated. Comments are divided on the reliability. There are some less positive comments about the memory and image quality. We analyzed user and expert ratings, product age and more factors. Compared to other Camcorders the Mustek DV 5000 is awarded an overall alaScore™ of 76/100 = Good quality. Don Bradbury reviews an inexpensive option for basic digital video, digital still photography, MP3 playing, and voice recording among other things. With minor cosmetic changes to the design, the DV5000 works in a similar manner to the DV4000 - to which review readers are therefore referred for a more detailed discussion of the functions, facilities, and general performance. 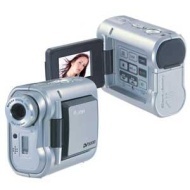 A 4.1 megapixel digital video camera for £130 sounds too good be true. What is surprising about this Mustek model is its superiority to its successor, the DV5500 which despite costing £40 more fails to measure up in terms of performance. BEST CAMCORDER IN THE WORLD!!!!!!!!!!!!!!!!!!!!!!!!!!!!!! Mustek brand has been globally well known for its excellent quality, professional support, and extensive service. Mustek has been recognized by many international magazines and professional organizations for its excellent innovation technology, production capability, and product quality.